Earlier this month, Congress voted to block the implementation of a key bundle of Obama-era education policies in a 50-49 Senate vote. A week later, Betsy DeVos issued her own replacement guidelines. Under her new rules, state education agencies have to consult with only one party as they write their accountability plans: the governor. The Every Student Succeeds Act (ESSA), the overarching federal education law in the US, specifies that each state must establish their own student performance goals and then create a plan to measure student performance and hold schools accountable to the state’s guidelines. But many of ESSA’s accountability rules are now up in the air just weeks before states are due to turn in their assessment plans to the federal government. Here are some of the big changes that are coming about as a result of Congress overturning the Obama administration’s ESSA accountability rules. 1. Under ESSA rules, each state has to put together a plan to assess the performance of their public schools. Under the old rules, state education agencies were required to discuss the performance guidelines and potential school interventions with a number of outside stakeholders. These included teachers, paraprofessionals, administrators, school staff, parents, and representatives from Native American tribes living in the state. Only after working with these groups could the state submit their accountability plans to the Department of Education. According to the new rules, however, only the governor has to approve of the accountability plans. Any other stakeholder participation is merely “encouraged”, not mandated. 2. ESSA requires that 95% of kids in a district participate in standardized testing in order to collect data. However, under the Obama-era rules, it was left up to the individual state to decide how much weight to assign to test scores when evaluating schools. State evaluations needed to include one quantitative measure in their evaluation, but were also free to include different kinds of metrics that focus on qualitative changes in school buildings rather than relying on testing alone. However, this language has now been revoked. 3. The former ESSA language allowed states to modify their assessment measures for different student populations and different types of schools. Under the old rules, a state could establish different English language proficiency goals for different groups of English learners or could create different assessment rubrics for different types of schools. This way, intentionally small schools, alternative schools, or recently-opened schools would be assessed differently from long-established neighborhood schools. This flexibility was intended to move away from a one-size-fits-all method of measuring student progress and sought to account for different student’s specific needs. This language was repealed, but not replaced, leaving space for state bureaucrats to create plans that meet ESSA’s bare minimum requirements. Even if states scramble to adhere to new rules, the executive branch hasn’t bothered to hire anyone to enforce them. Before leaving office, the Obama administration asked states to submit their ESSA-mandated school accountability plans to the federal government by the first week of April. Many states, including Illinois, are still working up to this deadline, despite the fact that the Department of Education has given them just weeks to adhere to the new rules. The question now is whether there will be anyone at their desk in the Department of Education offices in DC to read those plans once they’re turned in. In a characteristically complete disregard for education, the Trump administration still hasn’t filled many top jobs in the department. As we know too well here in Illinois, relying on the governor to make decisions about our schools can only result in impasse and austerity. We’ve already seen this in action. The Illinois ESSA accountability guidelines were supposed to be created by a committee made up of classroom teachers, principals, and administrators, including a CTU representative. The committee recommended that state accountability guidelines give as little weight as possible to test scores when evaluating schools. Rauner and his appointed State Board of Education overruled the practitioner committee and instead decided that 75% Illinois school’s ratings would be based on test scores and only 25% would focus on quality indicators like absenteeism and curriculum. 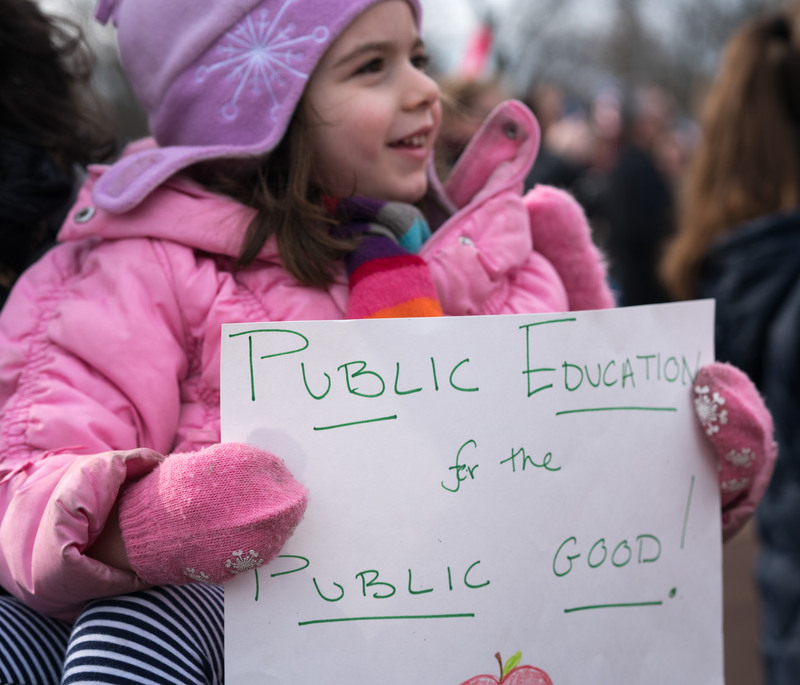 If we can’t rely on Governor Rauner to release state dollars to keep our most basic public services operating, how can we rely on him to craft effective education accountability guidelines? The new ESSA guidelines guarantee that millionaire politicians like Rauner and DeVos continue to dictate what types of services our students deserve and allow them to continue to ignore their constituent’s voices as they cut away at school budgets. And we know that our students deserve better than that. DeVos, privatization, school choice, Trump. Bookmark.